Only 30% of the mountain of new LNG supply has so far been commissioned. LNG market evolution from 2017-20 will focus on how the remaining 70% is absorbed. The LNG market is in the earlier stages of an unprecedented ramp up in supply. 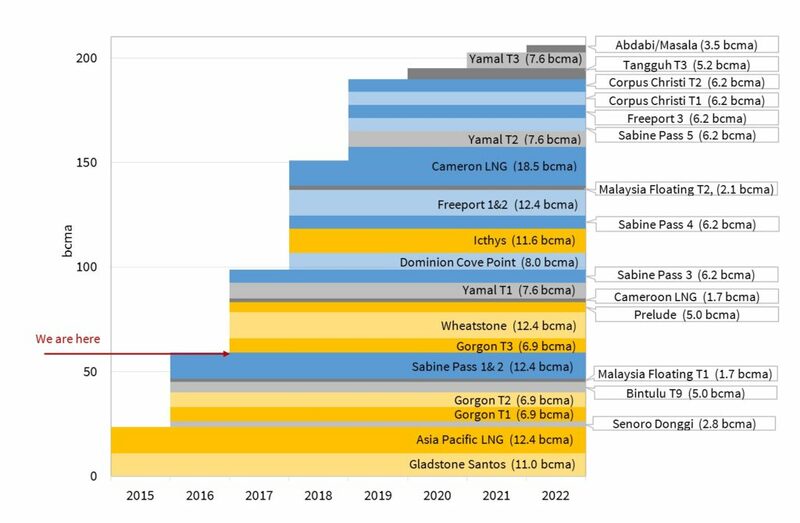 Global liquefaction capacity is set to rise by more than 50% by 2022. 205 bcma (149 mtpa) of new liquefaction capacity is past the Financial Investment Division (FID) and is under construction or has come onstream since 2015. We published an article in early 2016 setting out the characteristics of this mountain of new LNG supply. As we enter 2017, we are only approximately 30% up the mountain. There remains over 145 bcma (101 mtpa) of capacity still to be commissioned across 2017-22. 130 bcma (96 mpta), almost 90% of the remaining volumes, will come online over the next three years alone. In today’s article we return for a status check. Australian LNG liquefaction capacity which reached FID between 2009-12 and is due to come online between 2015-17. US LNG export capacity which reached FID between 2012-15 and is due online 2017-20 (in addition to Sabine Pass trains 1 & 2 which were commissioned in 2016). Chart 1 shows an updated view of the mountain of supply volume breakdown we showed last year. The capacity volumes shown in Chart 1 are based on target dates for first cargoes. However the full impact of new supply from the projects commissioned to date has been diluted by project ramp up times and delays. As observed in the last LNG supply growth surge in the late 2000s, there is a lag between anticipation and reality. New LNG trains typically have a commissioning ramp up time of 6 to 9 months from first cargo to full capacity. On top of this there have been a number of delays and disruptions to the ramp up of new LNG trains. Chevron’s Gorgon terminal has suffered perhaps the most prominent issues, with a series of unscheduled stoppages for maintenance disrupting supply from both Train 1 and 2. These issues, in addition to cold weather in China and nuclear maintenance in South Korea contributed to firming Asian spot LNG prices in Q4 2016. It should be noted however that despite these setbacks, Australian LNG exports for November 2016 were up 44% YoY. The impact of new supply is set to become more pronounced as 2017 progresses. Ramp up and teething issues for existing terminals are likely to recede. In addition the next wave of new projects are due to come online including the Wheatstone, Itchys and Prelude projects in Australia, the 1st train of the Russian Yamal terminal and Sabine Pass Train 3. Increasing European imports: LNG cargoes that are surplus to Asian (& emerging market) requirements are likely to end up in Europe, given liquid hubs, flexible contractual structures and an ability for the power sector to absorb gas. Further price convergence: Surplus LNG is likely to put downwards pressure on spot price differentials between Asia, Europe and the US. This could see the trans-Atlantic spread between NBP/TTF and Henry Hub compressing to non-sunk variable costs below 1 $/mmbtu. Beyond 2017 all eyes shift to the US. There is a committed delivery pipeline of more than 80 bcma of US export capacity, most of which is due to come online in 2018-19. The US is also the most likely next source of new liquefaction FIDs to supply the LNG market in the 2020s. In addition to possible FID’s for Sabine Pass Train 6 and Corpus Christi Train 3, the Golden Pass project, awaiting non-FTA approval could add a further 20 bcma of export capacity if it proceeds. Perhaps most importantly, the growing supply glut is set to see a substantial increase in the role of Henry Hub in driving the level of global gas prices as LNG trading arbitrage narrows spreads between key regional price benchmarks. Article written by David Stokes, Olly Spinks & Howard Rogers.